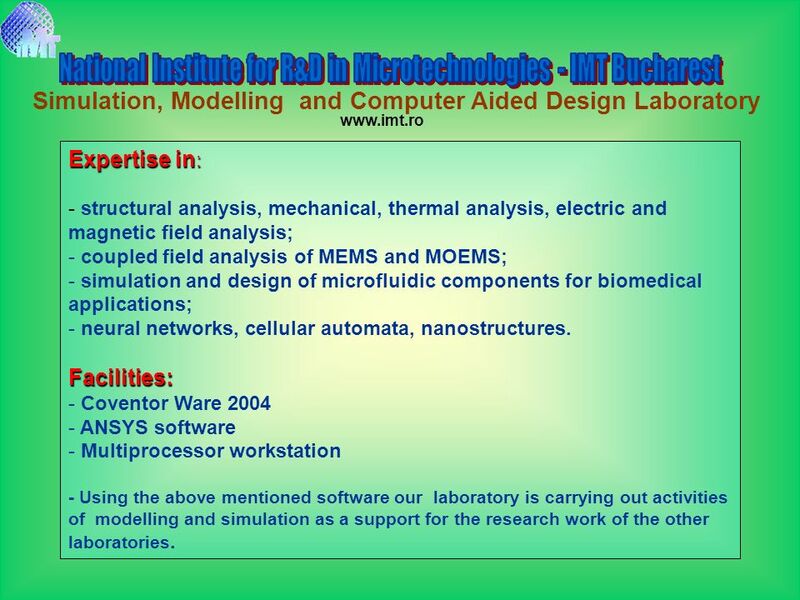 Expertise in: structural analysis, mechanical, thermal analysis, electric and magnetic field analysis; coupled field analysis of MEMS and MOEMS; simulation and design of microfluidic components for biomedical applications; neural networks, cellular automata, nanostructures. Facilities: Coventor Ware 2004 ANSYS software Multiprocessor workstation - Using the above mentioned software our laboratory is carrying out activities of modelling and simulation as a support for the research work of the other laboratories. 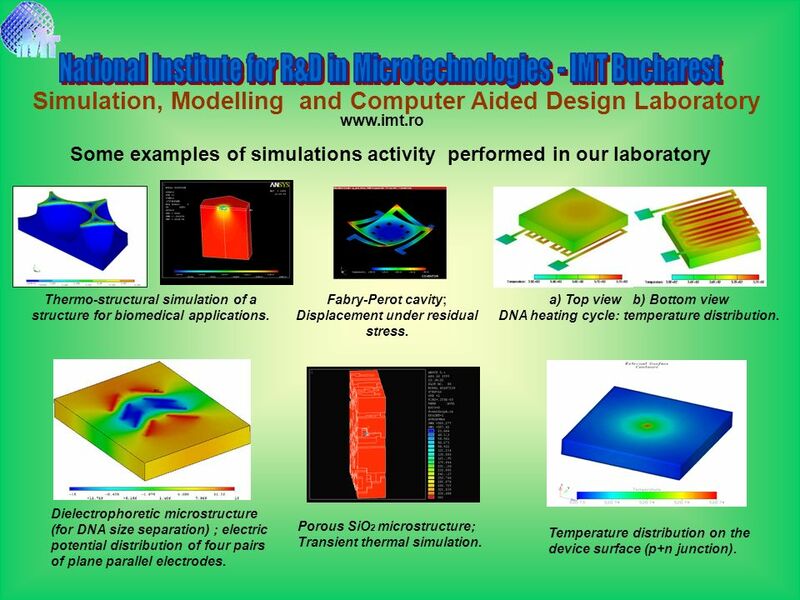 Some examples of simulations activity performed in our laboratory Thermo-structural simulation of a structure for biomedical applications. Fabry-Perot cavity; Displacement under residual stress. a) Top view b) Bottom view DNA heating cycle: temperature distribution. Dielectrophoretic microstructure (for DNA size separation) ; electric potential distribution of four pairs of plane parallel electrodes. Porous SiO2 microstructure; Transient thermal simulation. Temperature distribution on the device surface (p+n junction). Download ppt "Simulation, Modelling and Computer Aided Design Laboratory"
Nelson Research, Inc – N. 88 th St. Seattle, WA USA aol.com Thermally Induced Stress in a Glass-Silicon Bonded MEMS. 26th April 2004, From networking at the national scale to the integration in ERA National Programme for Research and Innovation New Materials, Micro and. 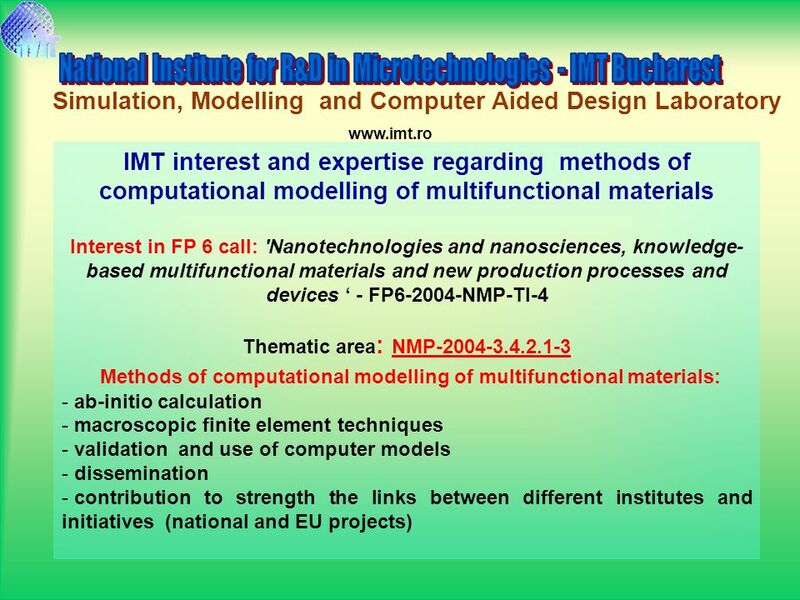 NEW SENSING DEVICES FOR IMPROVING THE QUALITY OF LIFE Interest in FP 6 call: 'Nanotechnologies and nanosciences, knowledge-based multifunctional materials. Communication Platform Integration of conventional and electronic means Authors: Phys. Elena Stanila, IMT- Bucharest Eng. Marian Vasile, iMediaSoft Romania. 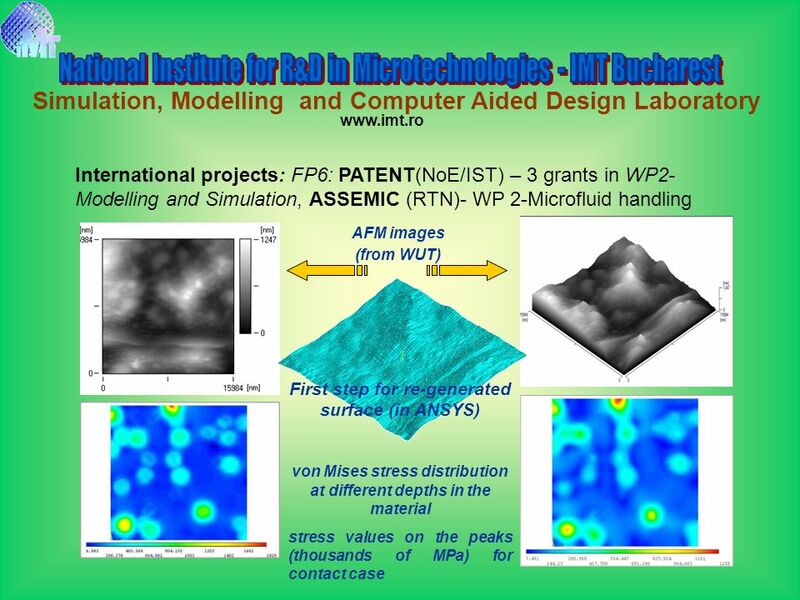 PATENT-dfmm Design for Micro- and Nanomanufacturing Packaging, Test and Reliability Engineering in Micro & Nanosystem Technologies Network of Excellence. Redesign of Die Internal Structure Dr. Henry Tan School of Mechanical, Aerospace and Civil Engineering The University of Manchester. Susan B. Sinnott, 1 Simon R. Phillpot, 1 Scott Perry, 1 and W. Gregory Sawyer 1,2 University of Florida, 1 Materials Science and Engineering 2 Mechanical. 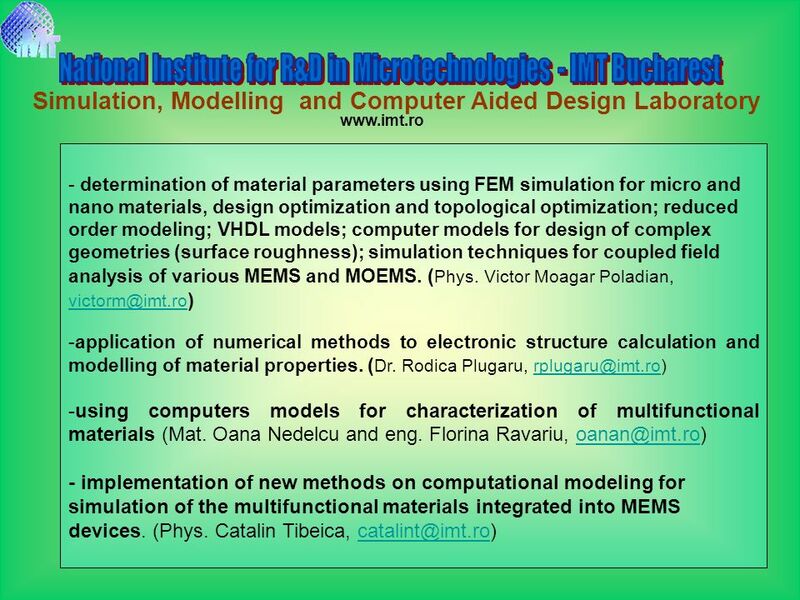 Course Introduction to virtual engineering Óbuda University John von Neumann Faculty of Informatics Institute of Intelligent Engineering Systems Lecture. Figure 1 – NSTX Upper Umbrella Assembly Upgrade Design: Version 4. Explosive joining of dissimilar metals: experiment and numerical modeling Anan’ev S.Yu., Andreev A.V., Deribas A.A., Yankovskiy B.D. Joint Institute for. Hamish L. Fraser Ohio Regents Eminent Scholar & Professor Department of Materials Science & Engineering The Ohio State University Center for the Accelerated. -1- Microstructure of solid surfaces – characterization and effects on two phase flows ___________________________________________________________________________________________.